B/W: Gonna Get Ready. I use NM / EX / VG+ / VG / VG- / G / Poor All records have been professionally cleaned. All records are vintage pressings unless otherwise noted. Powered by SixBit’s eCommerce Solution. 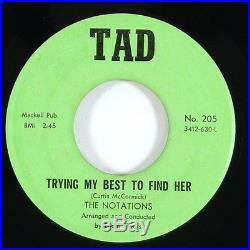 The item “Notations Trying My Best To Find Her Ultra Rare Northern Soul 45 Tad mp3″ is in sale since Wednesday, January 18, 2017. This item is in the category “Music\Records”. The seller is “paperstax” and is located in New York, NY. This item can be shipped worldwide.